Hi friend! I hope you’ve been having a magical week so far. I’ve been riding a ridiculous yoga high since returning to the city on Monday and it’s been fantastic! Now that November is here and a chill has settled into the air and your bones, it’s time to start busting out the deliciousness that is all low and slow cooked foods. Today you’re going to be making a total crowd favourite: CHILI! I made this recipe for a sweet Acro Yoga Training Millissa Greenwood put on last spring and I’ve had it in my back pocket ever since, waiting for the weather to be cold enough to justify it’s posting. 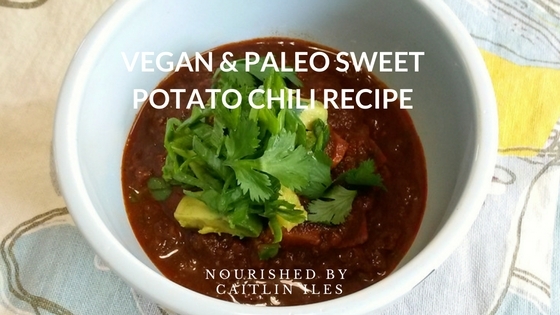 You can easily make this recipe vegan or paleo. For vegans, just swap out the beef for the 3 types of beans below. And if you want both, well as I always say, the more the merrier!! Up here in the great white north that is Canada, we are lucky enough to experience all 4 beautiful seasons. Now I know not everyone loves winter as much as I do, but regardless of whether you like the snow or not, the colder weather definitely necessitates some heartier food than the warm days of summer. 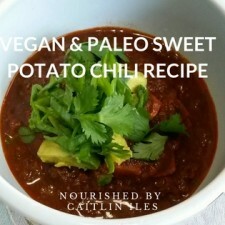 For this recipe I’ve added lots of hearty veggies, some nourishing (grassfed!) beef or hearty beans, and delicious toasty spices to warm you up from the inside out. This recipe may seem a little bit daunting, but you can always double it to make a HUGE batch to freeze so you always have a filling meal ready to go with no prep work required! This chili is full of rich, hearty flavours perfect for warming your insides during the colder months of the year. If you're pressed for time, skip the roasting process for the tomatoes and red peppers and just chop and add to the pot. Coat peppers and tomatoes with 1/2 tbsp. olive oil, place on baking sheet, and roast until skin browns and puckers. Once roasted, place in a metal bowl and cover with saran wrap for several minutes. Place a large saucepan over medium heat and add remaining olive oil. Add onions, celery, and garlic to pot, stirring to combine. Let sweat for 1 minute before adding beef and sweet potatoes. (This is where you would add the beans if using them). Add spices and balsamic vinegar and stir thoroughly. While simmering, remove skin from tomatoes and peppers. Roughly chop peppers and add to a bowl with tomatoes, mixing them together. Cover and let sit for 3 minutes before adding tomato paste, red peppers, roasted tomatoes, broth, and sea salt. Let simmer as long as possible to develop the richest flavours. I've let it go for 12+ hours. You can transfer it to a crock pot if desired. Top with avocado, green onion, and cilantro. Well that’s my warm and cozy, super grounding recipe for today! If you’re looking for a little kickstart to your healthy lifestyle, make sure you download my FREE 7-Day Healthy Detox Meal Plan right here!